Olufunke A. Fontenot has over 36 years of full time teaching experience at the college level in a diverse range of institutions, including 10 years at an overseas institution, 12 years at Historically Black Colleges, and 14 years at a state public liberal arts university. Dr Fontenot is a Senior Consultant with Stevens Strategy, LLC. She received tenure at three institutions, and is currently Interim Regional Vice Chancellor of Academic Affairs at University of South Florida in St. Petersburg, Florida. She has served in other administrative capacities, including associate provost department chair, associate dean, dean, interim provost, and affirmative action officer. At Georgia College and State University, Georgia’s designated liberal arts college, she served as interim dean of the college of education, associate dean of the College of Arts and Sciences, and interim department chair. 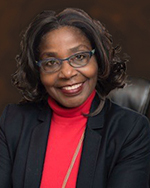 Olufunke has served on the board of several national professional associations. She served for five years on the Board of the Savannah Chapter of the American Red Cross, and as Chair of its SD-21(Diversity in the 21st Century Committee); on the Community Review Board of the Community Alternative to Detention; and on the inaugural board of Oglethorpe Academy, the first charter school in Savannah. In both her work on governing boards and her institutional roles, Olufunke has a vast experience in program and policy development and assessment, personnel management and strategic planning. Olufunke Fontenot received an Ed.D. in Higher Education Management from the University of Pennsylvania, an LL.M. from Yale Law School, an M.LITT. from Cambridge University in England, and an LL.B. from Obafemi Awolowo University in Nigeria. She is a 2007 graduate of the HERS Bryn Mawr Summer Institute for Women in Higher Education, a 2008 graduate of American Association of State Colleges and Universities’ (AASCU) Millennium Leadership Initiative (MLI), a 2009 recipient of the Nehru-Fulbright Fellowship to India, and a 2015 graduate of AASCU’s Becoming a Provost Academy (BAPA).